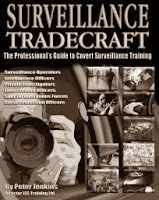 "Surveillance Tradecraft: the Professional's Guide to Covert Surveillance Training" by Peter Jenkins. Seriously good reference manual for beginner and veteran alike, updated material to that provided in "Advanced Surveillance". Check it out here. Uncharacteristically, I even posted a review (to which the author was good enough to respond to my only gripe). Last word: if you're a surveillance operator this is a 'must have' for your library. Thanks for the recommendation on this book, just got it and it is worth every cent. Can you kindly share what other books you would recommend on both investigations and surveillance? 2) "Secrets Of Surveillance: A Professional's Guide To Tailing Subjects By Vehicle, Foot, Airplane, And Public Transportation"
3)"Surveillance Countermeasures: A Serious Guide To Detecting, Evading, And Eluding Threats To Personal Privacy"
For investigations - well, now it gets a bit tricky since it is such a broad area, with different legal strictures in place depending on where in the world you are based, not to mention wildly differing capabilities to access various databases or public information. I personally find most US-written books to be not all that helpful on many subjects since I am not in that part of the world. 3) "Process of Investigation: Concepts and Strategies for Investigators in the Private Sector" by Charles A. Sennewald and John Tsukayama. The last is more geared towards an investigator working in a corporate environment but there is some worthwhile info in there for the average gumshoe as well, I think. There are a bunch of ebooks by Michael Hessenthaler available at low cost through http://investigateway.com/books_investigation.html that I have heard good things about but not actually gotten around to getting myself yet. Because of recent 'issues' I no longer own any books so will have to start my library again from scratch. Thank you very much for the information. I picked all of Michael Hessenthaler's ebooks a while back and have the two books by ACM IV Security services as well as their book 'Countering Hostile Surveillance'. I will buy the other books you mentioned in time.